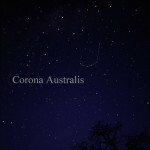 Corona Australis is a southern constellation that was cataloged by 2nd century astronomer Ptolemy, and remains among the 88 modern constellations. 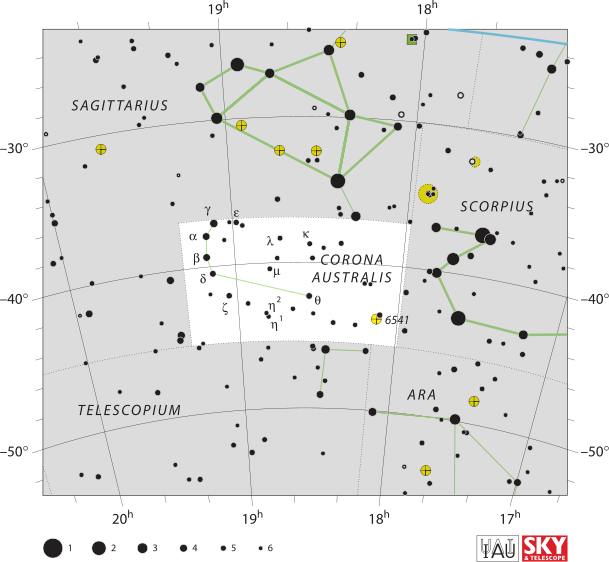 This horseshoe-shaped constellation lies about as far south as, and adjacent to the crook of Scorpius’ tail, and just beneath the teapot asterism of Sagittarius. Because of its far southern location in the celestial sphere, it barely rises above the southern horizon before setting again. 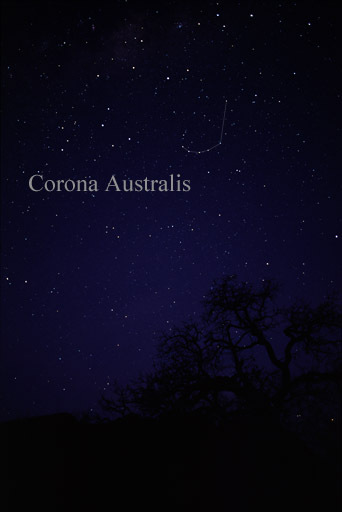 Corona Australis reaches its highest nightfall ascension in September. This constellation provides the foreground stars for a portion of the Milky Way pointing in a direction near the center of our galaxy. The most notable object in this region is the Corona Australis Molecular Cloud, a large and dark molecular cloud with many embedded reflection nebulae. There are many other telescopically interesting objects in this constellation to include star-forming regions with proto-stars, galaxies, and variable stars. 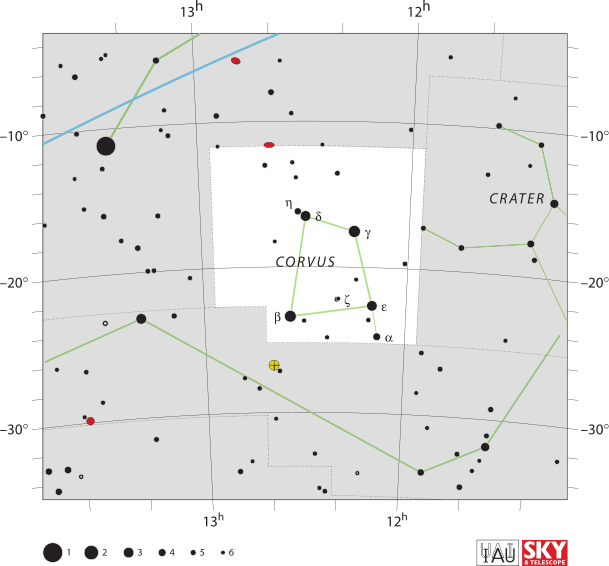 IAU Corona Australis chart, IAU and Sky & Telescope magazine (Roger Sinnott and Rick Fienberg), June 5, 2011. 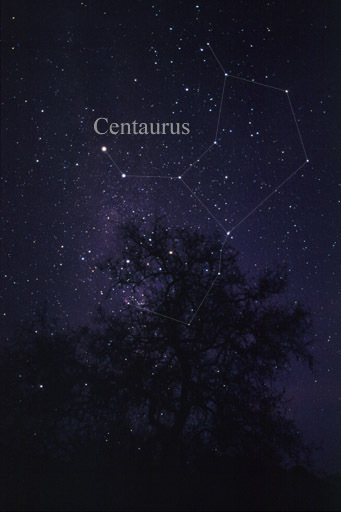 Centaurus is a large, bright southern constellation that is among the 48 constellations cataloged by 2nd century astronomer Ptolemy. Because it is located so far south on the celestial sphere, it rises only partially above the horizon at a 40-degree north location. It reaches its highest nightfall ascension in May. This constellation has the distinction of hosting our nearest stellar neighbor, the Alpha Centauri system. Located just over four light years away, this system consists of three components: Alpha Centauri A, B and C. Alpha Centauri C is also known as Proxima, which is actually the nearest of the three component stars, and the only one that cannot be seen with the unaided eye. 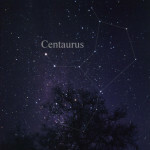 IAU Centaurus chart, IAU and Sky & Telescope magazine (Rober Sinnott and Rick Fienberg), June 4, 2011. Ara, the altar, is a southern constellation that is so far south as to never rise above the horizon for viewers at 40-degrees north latitude. It is included in this collection to complete the descriptions of the 48 constellations cataloged by 2nd century astronomer Ptolemy. 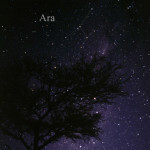 For those traveling south, to say Florida or farther, look for Ara to reach its highest nightfall ascension in July. 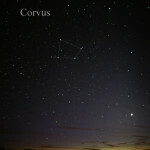 It is located just beneath the crook of Scorpius’ tail. 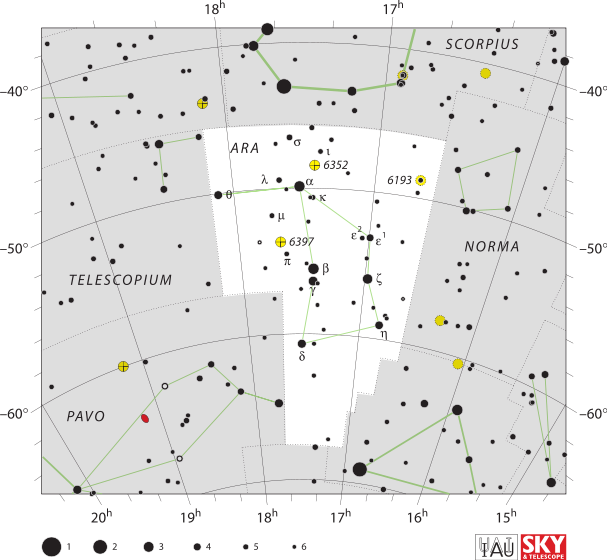 IAU Ara chart, IAU and Sky & Telescope magazine (Roger Sinnott & Rick Fienberg), June 4, 2011. 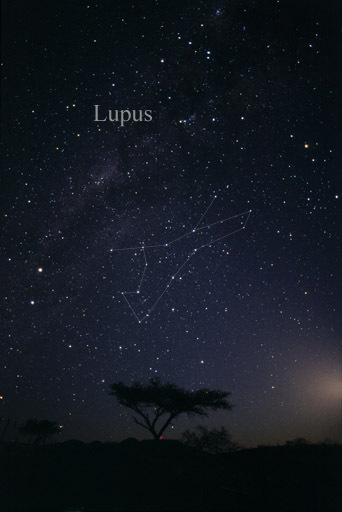 Lupus, the wolf, is one of the 48 constellations cataloged by 2nd century astronomer Ptolemy that remain among the 88 modern constellations defined by the International Astronomical Union. It is a southern constellation that is so far south that it barely peeks above the horizon in June and July for viewers at 40-degree north locations. It is situated beneath the scales of Libra, and to the right of Scorpius. 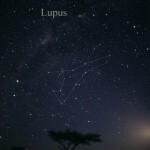 There are no Messier objects in Lupus, and the several NGC objects located there are difficult for northern observers because of the constellation’s low placement on the horizon. 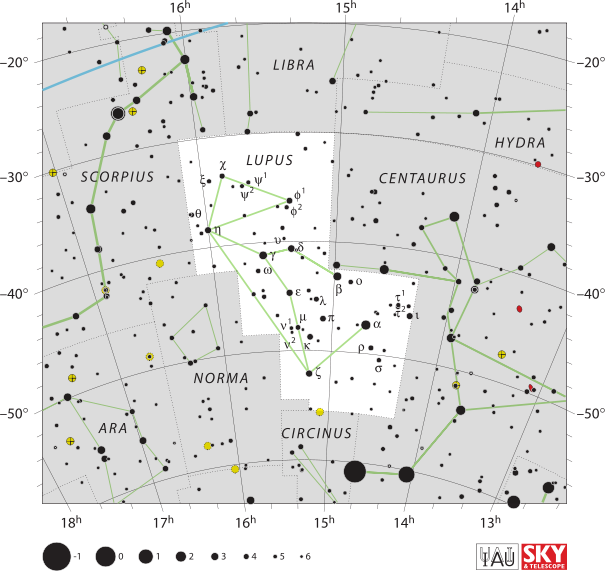 IAU Lupus chart, IAU and Sky & Telescope magazine (Roger Sinnott and Rick Fienberg), June 5, 2011..
Crater is Latin for cup, and this constellation represents the cup of Apollo in Greek mythology. This is one of the 48 constellations identified by the 2nd century astronomer Ptolemy. It is located below Leo’s feet, and behind Virgo’s back in the southern sky, sharing two stars with the constellation Hydra. 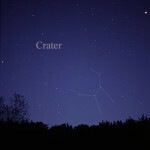 This constellation reaches its highest nightfall ascension in April. 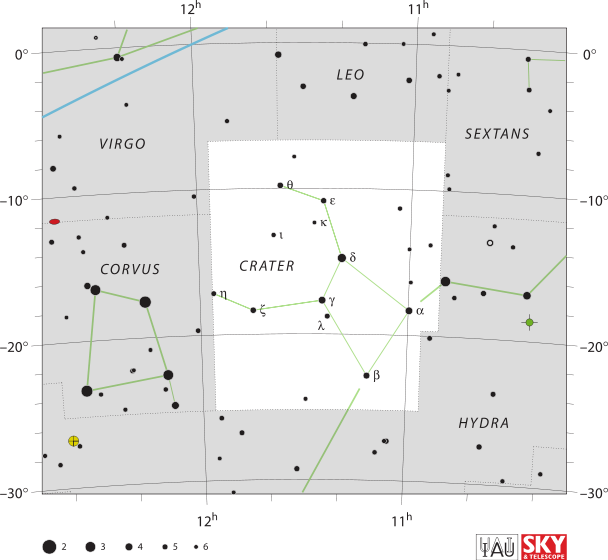 Aside from a handful of NGC objects that are a challenge for amateur astronomers, there is not much to see in this constellation. IAU Crater chart, IAU and Sky & Telescope magazine (Roger Sinnott and Rick Fienberg), June 5, 2011. 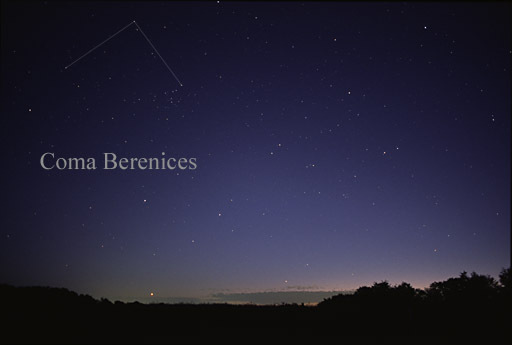 Coma Berenices represents the hair of Berenice II, queen of Eqypt and wife of 2nd century astronomer Ptolemy. Surprisingly, this constellation is not one of the 48 that 2nd century astronomer Ptolemy cataloged. As a naked eye object, this constellation is not much to behold. 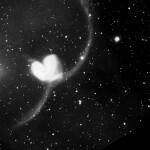 Its three main stars are rather dim, and the form of the constellation is rather nondescript. It can be found nestled among the intersection of Leo, Virgo, and Bootes, and it reaches its highest nightfall ascension in May. 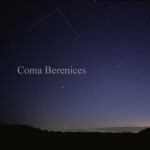 With binocular or telescopic aid, Coma Berenices is a wonder to behold. 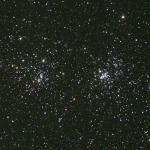 Most notable is the large Coma Berenices Open Cluster (Melotte 111). This star cluster is comprised of about fifty stars that are spread over a five-degree (the width of ten full moons) area of the sky. 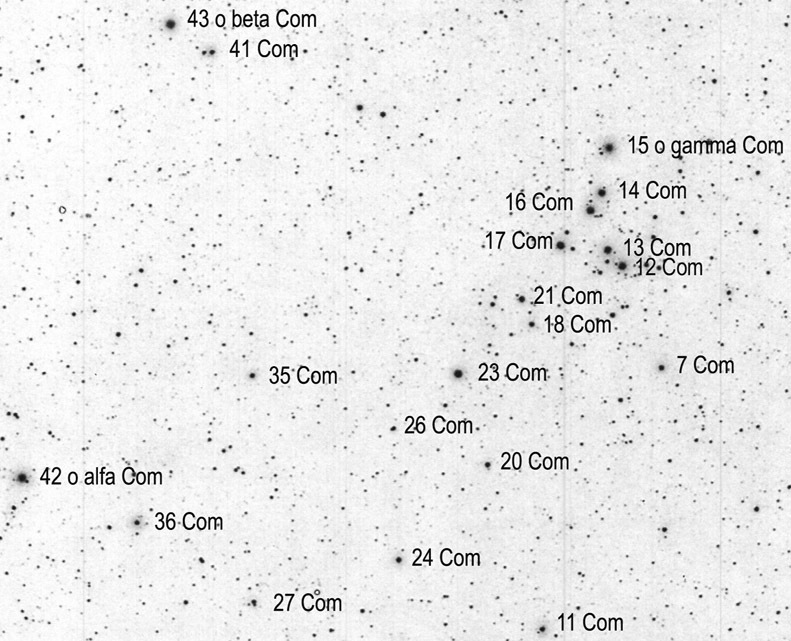 To look at Coma Berenices with binoculars is to see this cluster. 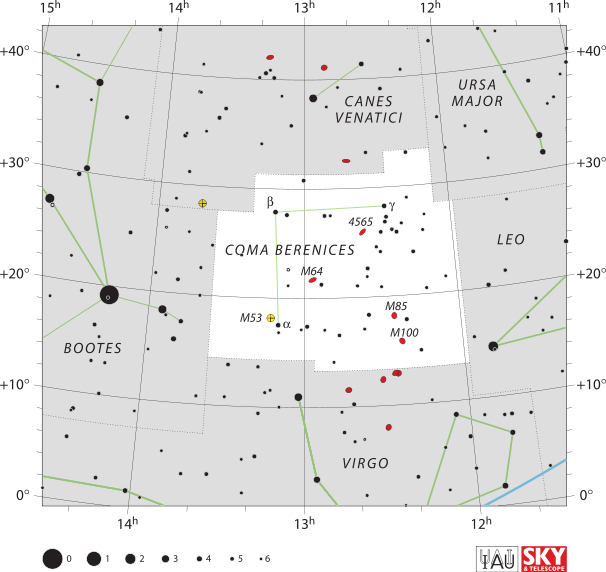 This constellation is also home to the northern portion of the Virgo Galaxy Cluster where several Messier galaxies can be found, to include M85, M88, M91, M98, M99, and M100. There are two other named galaxies in Coma Berenices, the Black Eye galaxy (M64) and the Needle galaxy (NGC 4565). 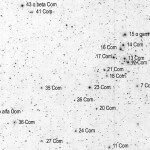 IAU Coma Berenices chart, IAU and Sky & Telescope magazine (Roger Sinnott and Rick Fienberg), June 5, 2011. 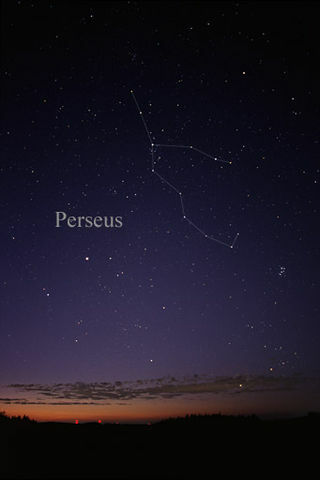 The constellation Perseus is located near several other constellations to which Perseus is related in Greek mythology: Cepheus, Andromeda, Pegasus, Cassiopeia, and Cetus. This constellation was one of the 48 constellations cataloged by 2nd century astronomer Ptolemy that remain among the 88 modern constellations. 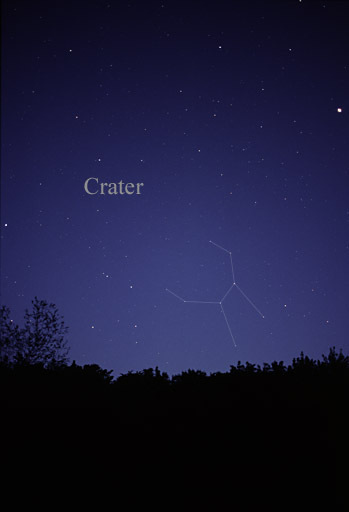 This easily spotted constellation is well placed high in the northern sky and best seen in January. It is found between Cassiopeia and the Pleiades, and Mirfak (Alpha Persei) is its brightest star Its most interesting star Algol (Beta Persei) is an eclipsing binary star. Its variable brightness, which is noticeable to the naked eye, decreases by over one degree of magnitude for about ten hours on a cycle time of just under three days. This star is also known as the Demon Star, because the ancients perceived its variability as an ominous sign. 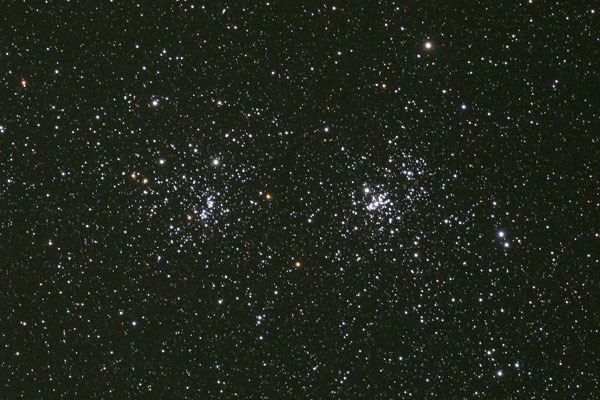 Also notable in this constellation is the Double Cluster (NGC 869 and NGC 884), which are naked eye objects under very dark skies. 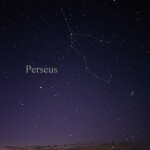 Perseus is home to two Messier objects, M34 and M76, and to the Perseids meteor shower. 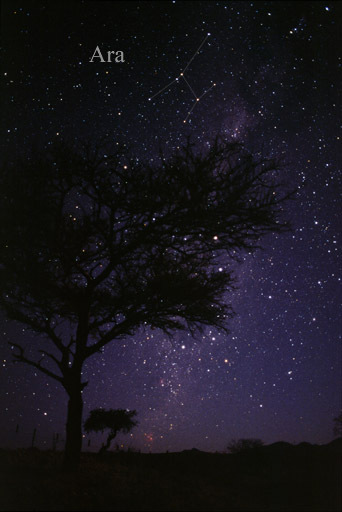 This meteor shower, one of the most consistently prominent meteor showers each year, lasts from mid-July to late August, peaking between the 9th and 10th of August. 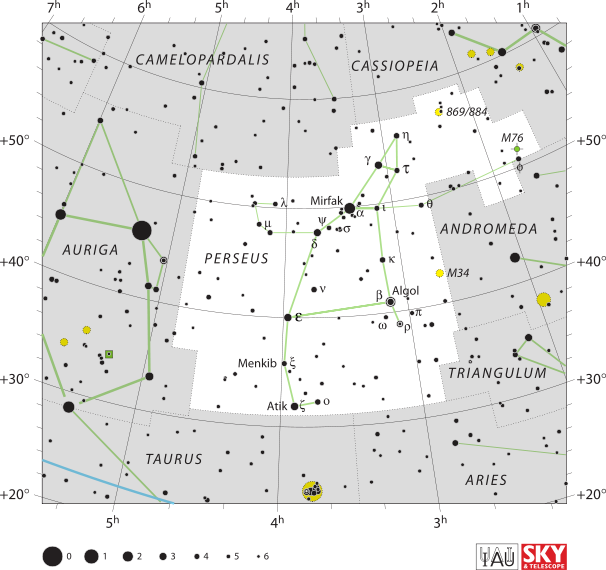 IAU Perseus chart, IAU and Sky & Telescope magazine (Roger Sinnott and Rick Fienberg), June 5, 2011. 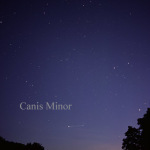 Canis Minor is the lesser dog that follows the great hunter, Orion. This constellation was one of the 48 constellations cataloged by the 2nd century astronomer Ptolemy that remains among the 88 modern constellations. 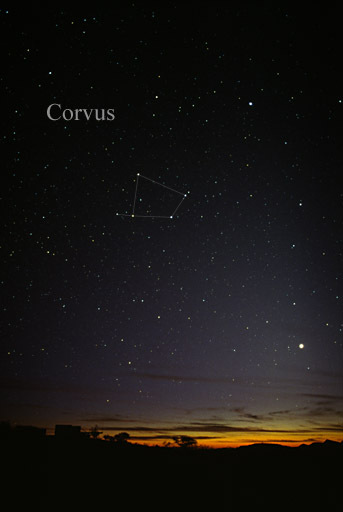 This small, 71st-largest constellation is best seen in March, and is located east of Orion, south of Gemini, and northeast of Canis Major, the greater dog that follows Orion. 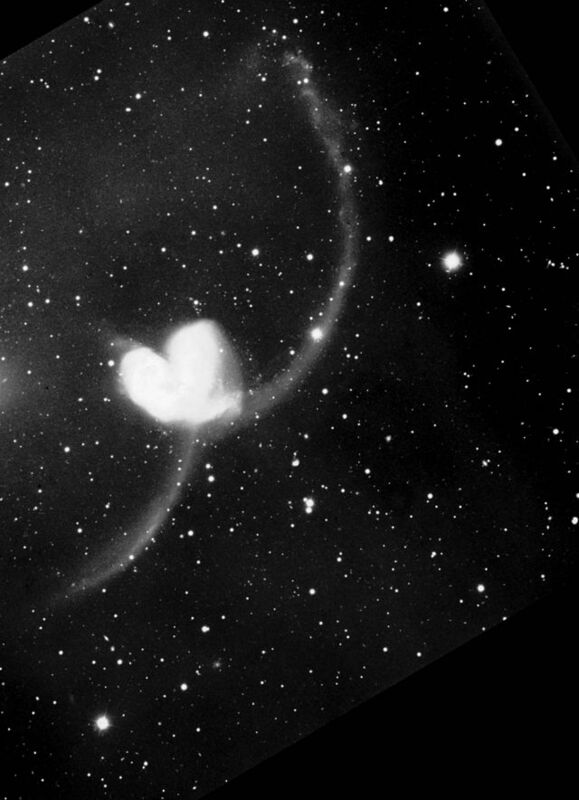 Its brightest stars are Procyon (Alpha Canis Minoris) and Gomeisa (Beta Canis Minoris). 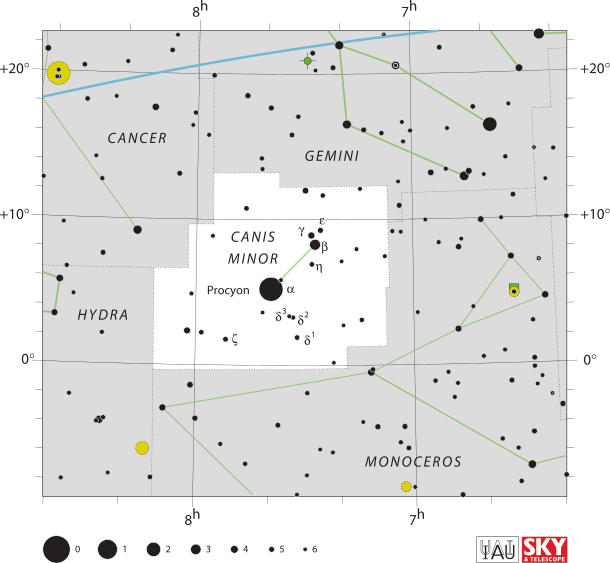 This constellation contains the Canis-Minorids meteor shower, which lasts from 4-15 December, and peaks over the nights of 10 and 11 December. 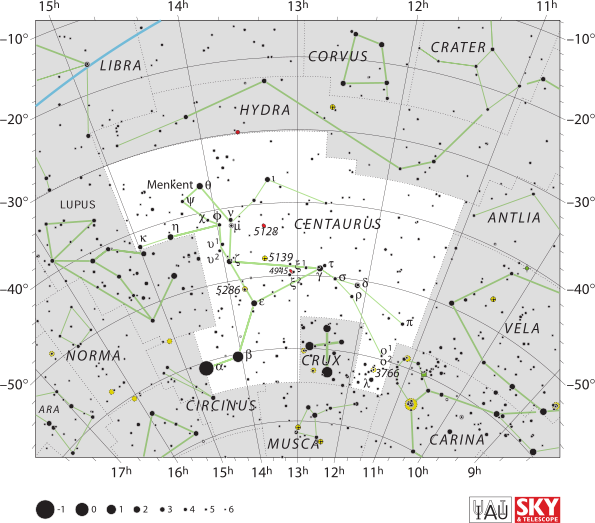 The Milky Way runs through this constellation, but it contains no Messier objects. 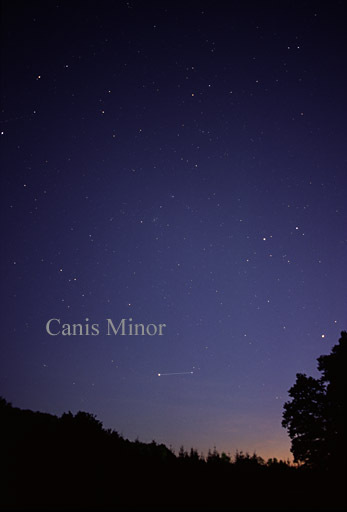 IAU Canis Minor Chart, IAU and Sky & Telescope magazine (Roger Sinnott & Rick Fienberg), June 4, 2011. 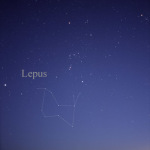 Lepus represents a hare (not to be confused with Lupus, the wolf) that is being hunted by Orion and chased by his nearby dogs, Canis Major and Canis Minor. This constellation lies just below the celestial equator, and immediately south of Orion. 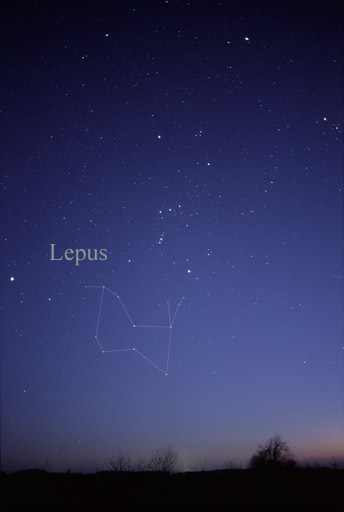 Lepus was one of the 48 constellations cataloged by 2nd century astronomer Ptolemy that remain among the 88 modern constellations. This 51st-largest southern constellation can be best seen in February. M79, a globular star cluster, is the only Messier object located in this constellation. 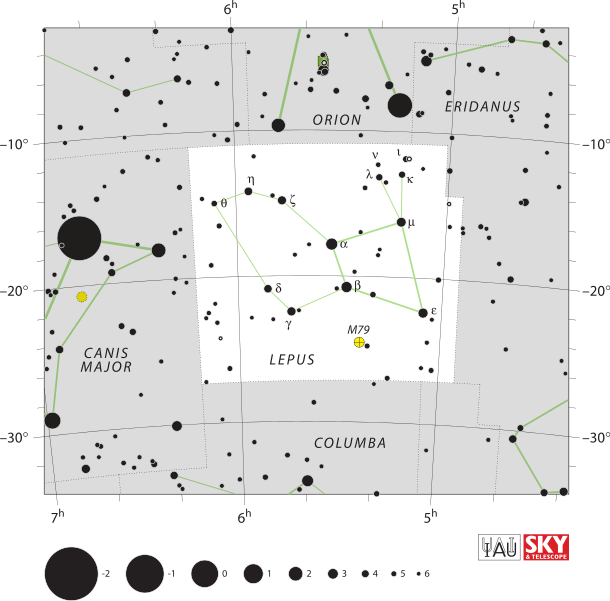 IAU Lepus Chart, Sky & Telescope magazine (Roger Sinnott and Rick Fienberg), June 5, 2011.